Firhill Stadium previously known as both Firhill Arena and Firhill Park is a multi-purpose stadium located in the Maryhill borough of Glasgow. Home to local football team Partick Thistle F.C, the 10,102 capacity ground first opened in 1909 and is also used for Rugby League and Rugby Union matches. Partick Thistle’s Firhill Park first opened back in 1909 on a plot of land left unused by Caledonian Railway after the club were forced out of their Meadowside home next to the River Clyde in order to make way for a shipyard. Prior to this the club played football at various venues since forming back in 1876 including Jordanvale Park and Kelvingrove with the move to Firhill marking the first time in Partick’s history that they would have a permanent home for an extended period of time. The new ground opened in September 1909 in time for the new season after the plot of land was acquired by the club for £5,500 the previous year. With an initially large opening capacity, the record attendance for a club game of 49,838 was set in 1922 when The Jags entertained Rangers, although this record was broken when Scotland played Ireland six years later in the 1928 British Home Championship with 54,728 fans in attendance. 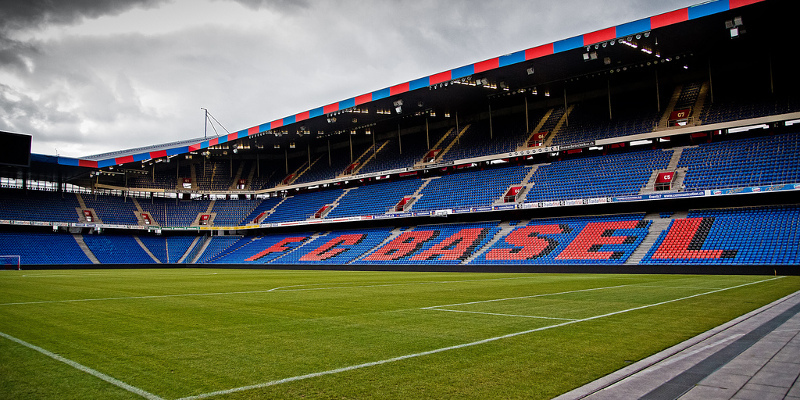 Renovations during the 20th century and post-millennium have occurred sporadically with the Main Stand which is still in use today, remarkably constructed back in 1927. The most recent construction has been the new North Stand which was built to satisfy the new regulations of the Scottish Premier League after the club was promoted from the Fist Division after the 2002/2002 season. Before this, the Cantilever designed Jackie Husband stand which opened in 1994 was the most recent refurbishment of Firhill Arena. 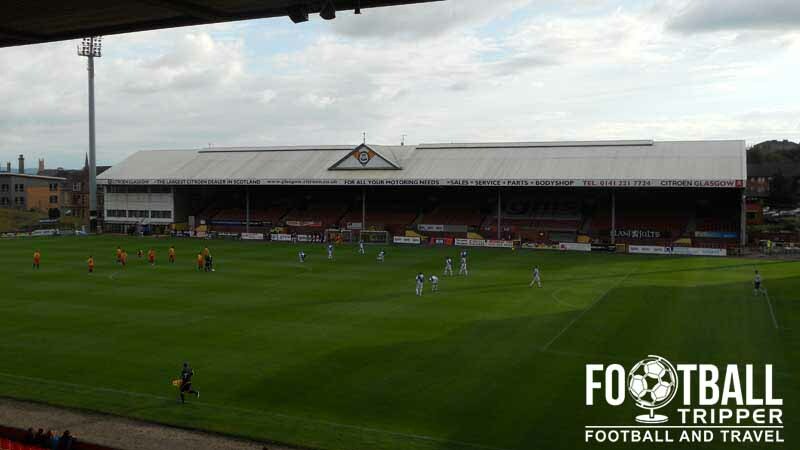 Two of the more famous fixtures to be played at Firhill include a friendly match against Tottenham in the 1955 and in the same season when Swedish side Djurgårdens IF played their home fixture against Hibernian F.C in the European Cup for what appears to be logistical reasons. 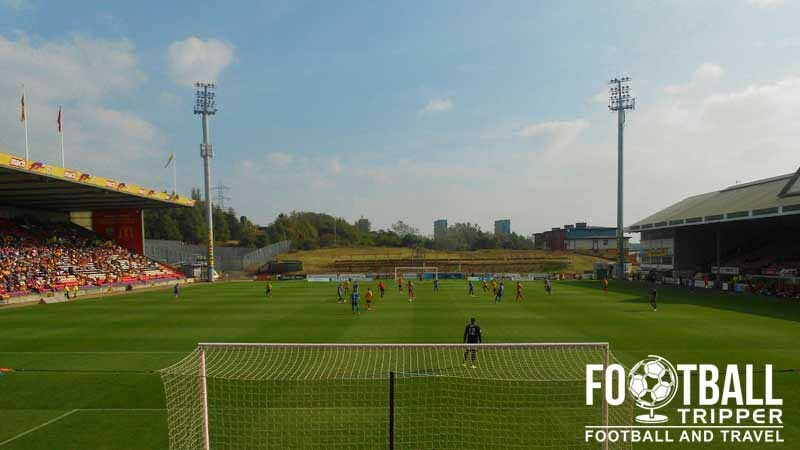 As for the future of Firhill Park, it looks like the South End of the ground is next in line to be replaced with Partick Thistle submitted plans to Glasgow Council on the 7th November 2014. 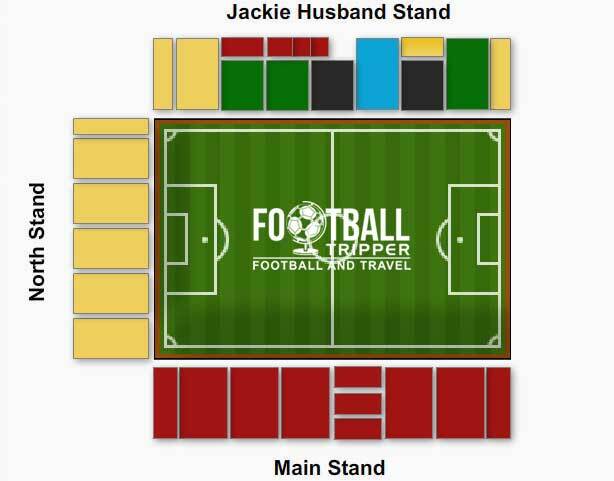 Firhill Stadium is comprised of four stands: North, East, South and West. Click the thumbnails above to enlarge an image of each stand and to read a more detailed description of each part of the stadium. Away fans are usually housed within the former main stand which sits on the western perimeter of the pitch. As the oldest section of the ground, it is the only stand to feature support beams however it never usually sells out which means you can often move between seats to find the best possible view once inside the stadium. The closest pub to Firhill Stadium on matches is the low-hanging Munn’s however due to its location it tends to be reserved for home supporters only. This also appears to be the case for the smallish Star & Garter meaning that travelling supporters are advised to either drink once inside the ground or within Glasgow itself. The vibrant city centre has numerous pubs to choose from with traditional style boozers including Edward G Wylie which is a Wetherspoons housed within an old Victorian Building, The horseshoe bar which is a century old pub known for its selection of ales and pies, and The Ark which despite its modern exterior has all the trappings of a decent English Pub including the food menu. Compared to the pub situation, things are slightly better regarding the food front when it comes to eateries close to the ground. On Maryhill road there are independent places such as Renzo’s Fast food, a Chinese place called Mr Rice, and The Italian Job takeaway express. Keeping within the confines of the inner city as separated by the north-western stretch of the M8 there are numerous fast-food franchises to choose form. These include KFC, McDonalds, Burger King and Subway, all of which are less than five minutes away from both stations. The club shop at Firhill Stadium is unfortunately open on matchdays only, which means that unless you’re planning on purchasing something on the day of the match you might be better off visiting the club’s online replica store instead. It doesn’t look as if Partick Thistle offer fans to the chance to our the facilities a Firhill, however if this changes in the distant future we’ll be sure to update this section. Partick Thistle fans applauding their team’s efforts on the pitch. 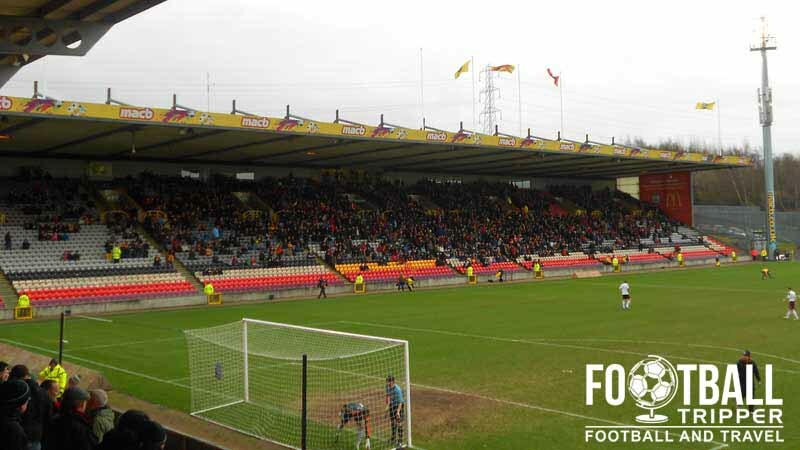 Tickets to see Partick Thistle in action at Firhill can be purchased from the club’s main office Monday to Friday between 9.00 am – 5.00 pm, and on matchdays from 10.00 am until 90 minute s before kick-off when the portable ticket office at the Jackie Husband Stand opens. You can also purchase tickets from PTFCTickets.com, or by phoning the club on 0141 579 1971. Please note that for certain high-profile matches there are no on the day ticket sales, and prices are likely to be more expensive. Firhill Stadium is located approximately 2 miles north of Glasgow City Centre within the Maryhill area of the city next to part of the Scottish Canals. The entrance to Firhill Stadium’s main stand. If you are visiting Glasgow from the north of Scotland then your nearest station is Queen Street, whereas if you’re visiting Firhill Stadium from the south then you will arrive in at Glasgow Central Station. Glasgow Central Stadium from outside. There is a bus stop on Firhill Road which runs parallel to the length of the stadium, however these stops are served by less frequent bus services than the ones on the nearby Maryhill Road. For complete bus timetables from the city centre please visit First Group Glasgow. If you must stay close to Firhill at all costs than there is the Beersbridge Annex which you book a room for, however with the city centre less than 20 minutes away you’re better of staying there due to the more varied choice. Recognisable names include Travelodge, Premier Inn, and Holiday Inn Express which is close to Glasgow Central Station.